'Big scoops' big part of game today. 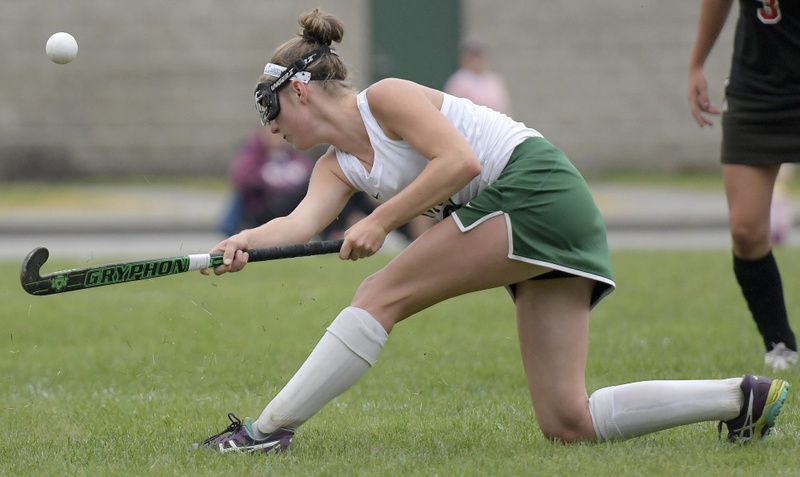 The path to field hockey success can often be a bumpy one traversed over grassy fields subject to the whims of dry summers or wet autumns. Grass or turf, the general way to get the ball from point A to point B is along the ground. Another method is the aerial pass, a maneuver not designed to avoid bumpy passes but one to move the ball quickly past the defense. Aerial passes are common in the high school game these days, a byproduct of their use on travel teams where players are generally more skilled. A big scoop is an accurate way to describe an aerial pass since the passer, generally starts from a dead ball situation and scoops the ball over the defense, sometimes to a teammate but more often to open space where a teammate can run onto the ball. Aerials require not only strength but honed techniques as well. Ward estimates she can fling an aerial pass from just beyond midfield to the top of the penalty circle while Perkins says one of her good passes travels 25 yards. Of course hard free hits can travel much farther, especially on turf, but that’s not always an option. Lifting the ball to open space or targeting a lone teammate is a must under the rules since lobbing a ball into a crowd is ruled dangerous. McLaughlin said officials have three criteria to consider while the ball is in the air from start to finish and the shot leaves a lot of room for interpretation. “Sometimes the ruling on when it’s dangerous is fuzzy,” Cony coach Holly Daigle said. Doughty said her team uses aerials, or not, often based on how they’re called by officials, but she doesn’t deny their effectiveness. And unlike many teams, she has several players who can execute aerials. Aerials can be used to shoot the ball on goal as well but they more often lead to goals. At least one Perkins aerial — to junior Moriah Hajduk — resulted in a goal for the Ramblers this season. And another led to a 2-on-1 break that finished in the cage.